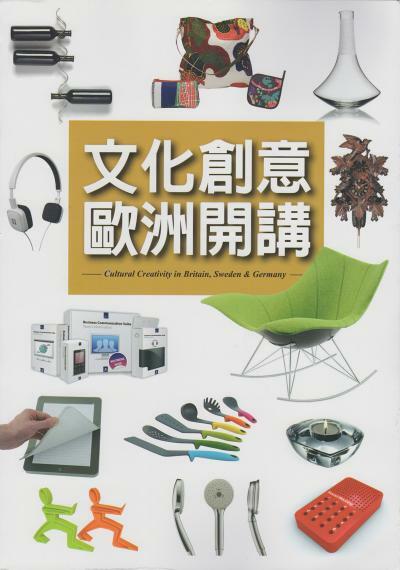 Shed was honoured to be featured in a prestigious report from the Taiwan Trade Council entitled 'CULTURAL CREATIVITY IN BRITAIN, SWEDEN & GERMANY'. Shed's SOUND MACHINE and NOTPAD were also featured on the front cover of the report... The translation of the article is below the images. Thank you to the wonderful Clara Ho for the fabulous translation. To say that Sheridan Simove is England’s trendsetting entertainment genius is no exaggeration at all. He hails from a family of artists, performers and authors, and has always been an ‘Ideas Man’ since young. Growing up with innovative thoughts that were always unique and different, he has since tapped those ideas, built a business from scratch, published books and occasionally speaks to companies about setting up an enterprise. Simove graduated from one of England’s most prestigious colleges - Balliol College, Oxford, and after graduation went to Disneyworld in Florida to work for two years where he dressed up as a 16th century gentleman. After that he went on to join in the production of the ‘Big Breakfast’, ‘Space Cadets’ and ‘Big Brother’. In a short space of time, he went on to become a household name in the television circle as an upcoming creative talent. In 2003, he went on to become a Channel 4 commissioning editor for the BBC. In the time that he was in television, he discovered talents like Kelly Brook, Tess Daly and Russell Brand. When his career took off, instead of relaxing and taking things easy, he worked even harder to establish his innovative business empire, coming up with conceptual products, toys, popular adult gadgets, books, cards and even going on to create his own currency of coins and bills! At this point, he has sold a million items, designed alphabetical candles that spell ‘You’re old’ and come up with the 16-sound remote controlled ‘sound machine’ that won England’s Gift of the Year prize twice. With the amount of profit gained, Simove then started growing and expanding his business from there. His views on the parameters and standards of success aren’t the same, because in his opinion, giving inspiration and joy to others is the first and foremost objective. Simove gives credit to his mother who he says, was always encouraging him to be creative. He gains inspiration from the most mundane details of life. There was once he saw someone selling software notes on ebay and he got an idea to produce his own coins and bills to sell online. He printed his name and how to reach him on top of those coins so that people could directly pop them into their wallets for safekeeping. After seeing Apple launch the tablet computer, he used the same product parameters and created a notebook which had the same size and thickness of the ipad. It even has the same Apple logo and colour scheme. Those familiar with Apple products would no doubt find that amusing and smile (‘I see myself as an entertainer, and also an artist. This may sound a little conceited , but I always use the latest products and turn them into completely different items. Everything to me is a piece of art.’) He says that in the process of revising product designs, it is inevitable to have problems with intellectual property and patent rights. Like using the Apple product for example, he would usually communicate to the company his intentions and ideas instead of giving the impression that he’s trying to copy their product. Most of the time he can get them to go along with it, and therefore he has never yet met with any legal challenges. He would also search for manufacturers on the Alibaba website. He says that the worst case scenario would be him giving out products like souvenirs. He is still able to rely on best-sellers to compensate for the cost of production and the losses on other products. 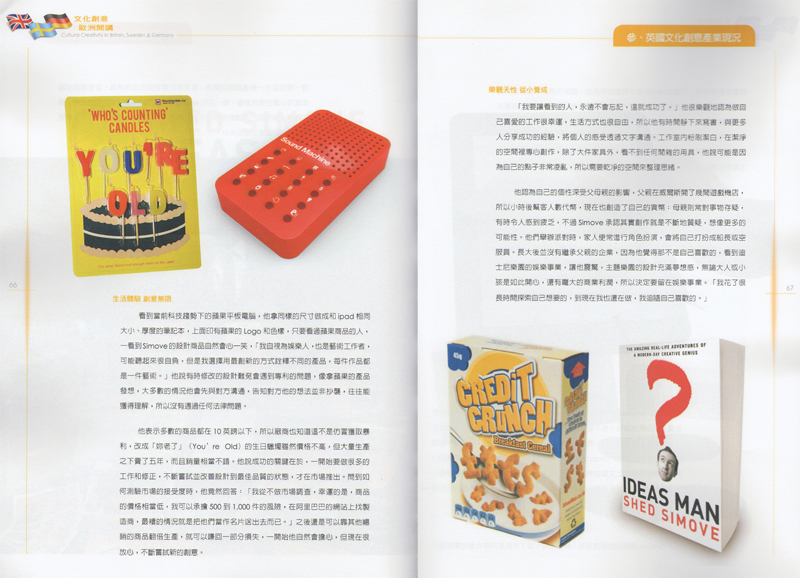 Initially, he would be a little nervous before the launch of a product, but now he is more relaxed and continually comes up with new business ideas. “I want people who set eyes on it, to never forget it. That’s success to me” He very optimistically deems that one who does what they love is extremely lucky. His lifestyle is also very flexible, so he can afford some quiet time to write, sharing his experiences with other people through the written word. His office space is spick and span as he concentrates on his work in a clean and minimalistic environment. Apart from large pieces of furniture, you can hardly see anything else. He reckons that perhaps because his ideas are running wild inside his head, he needs some clean, external spaces to sort out his thoughts. Even though his products are inexpensive this hardly means that Simove pays less attention to them. He maintains extremely high standards with his products. At entrepreneurial talks, he always emphasizes originality, not doing what others have done - simply because it isn’t special anymore. He teaches some specific entrepreneurial skills to businesses. For example, a chopping board that is modeled after Shakespeare involves combining two different techniques. ‘Chopping board’ and Shakespeare’s ‘The Bard’ sound similar, so he prints a picture of the writer on the chopping board. People who see it find it terribly interesting and yet no one has ever had this idea before. It thus becomes a one of a kind product. A lot of his ideas are a result of pure creativity. What can start off as a joke can easily become an innovative product on the market. When Simove has checked that his idea hasn’t been replicated elsewhere, he subsequently looks for companies that can help him produce them. As England has high production costs, he goes to the Far East to look for material and production. But it also means that holding on to the production control of his products has to be even tighter. He expresses that he would not sign anything before seeing a sample or photograph. He never puts down an order of more than 500 for the first collaboration with a company. Initially he’ll start with a small order. After the first batch is sold, he steadily increases the order and simultaneously tries to find out how to increase sales. This way, he also doesn’t have to deal with the problem of finding places to store them. Sometimes he’ll give creative license to other companies. At present he has 400 different ideas, so he’ll do the initial designs, find manufacturers and discuss design with their artists. Then he’ll do an added round of improvements to give the products a fighting chance of doing well on shelves. He reiterates that collaborating all 3 aspects of design, production and distribution are the key things to take care of. He finds joy in working together with the designers because they are most familiar with processes and materials in the production cycle. Because production costs need to be balanced with budgetary considerations, he always strives to cut down the cost of material and is thus even more careful. When discussing the manufacturers he chooses to work with, he is quite open to working with Asian companies. The only thing is that his products have a lot of English word play in them and therefore the firms that he works with needs to get his humour. This needs to be communicated well and the best way is usually done face to face. He is also willing to help manufacturers conceptualise interesting ideas. Take for example, the idea he came up with for a glass company – to build a glass that was ‘half full’. And that’s a thinker! With so many creative ideas, it is inevitable that people might try to copy them. But Simove isn’t too worried about this. Initially, he tried to protect his ideas and spent a lot of money doing so. But now his strategy is to ‘do it efficiently, quickly, and be the best’. He reckons that life is too short to waste time filing lawsuits, as long as people don’t use his designs against his business detrimentally. Just having people appreciate his work is also a kind of benefit to him. He believes that anyone can undertake his line of work as long as they grasp several techniques and have their own blend of originality. The most precious and unique thing about the human race is their creativity. He hopes that in the future, more people would be able to join the team. Adding fun and making life more interesting is the sole objective of Simove’s entertainment empire.